Owners of the Land Rover Defender 2.2 (122PS) can now enjoy a performance boost courtesy of Superchips, the Buckingham-based world leader in ECU remapping. Designed for September 2011 onwards Euro 5 models of the legendary four-wheel drive, Superchips has developed this remap with a focus on improving low rev power and torque. 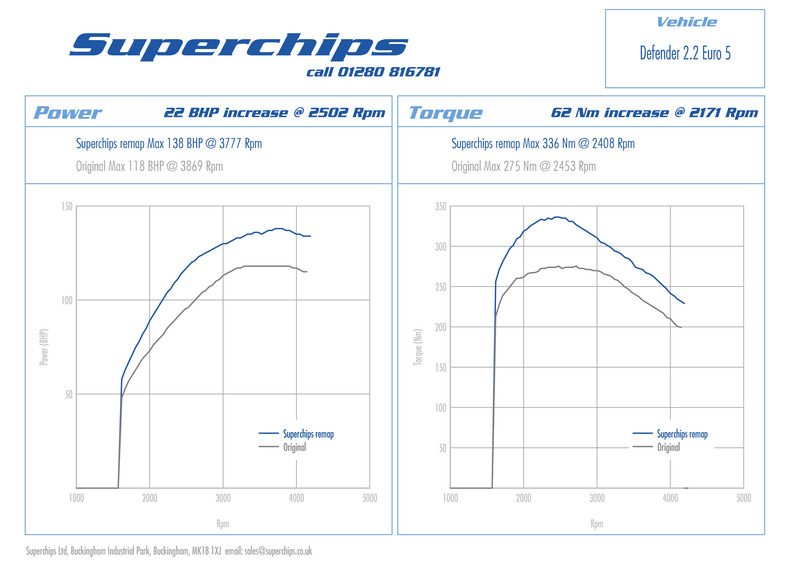 In house dyno assessment combined with real world road testing has enabled Superchips’ technicians to release an additional 22 bhp at 2502 rpm, allied to an impressive extra 62 Nm at 2171 rpm. Once installed, towing, load hauling and off-roading becomes more pleasurable with the Land Rover. In addition the Defender’s fast road abilities are noticeably enhanced, with extra urge for overtaking and fast motorway cruising. And thanks to the extra low rev pulling power, fuel economy improvements of up to 7% can be realised if the Defender is driven in a ‘like for like’ manner compared to the standard version. The Land Rover Defender 2.2 (122PS) Euro 5 Superchips ECU remap is on sale now, priced at £365.00 including VAT and installation. The conversion is also covered by Superchips’ industry-leading 12-month/30,000-mile warranty*. Please note, due to the design of the Euro 5 Land Rover Defender’s Siemens SID208 ECU this upgrade must be installed at a Superchips dealer. Watch the Superchips ECU remapped Audi A1 1.4 TFSI 122 PS in action! We invite you to check out the video of the Superchips ECU remapped Audi A1 1.4 TFSI in action on the road and on the dyno, highlighting the huge differences in power, torque and throttle response realised by the conversion.